Shaun Quade opened his multi sensory restaurant Lûmé South Melbourne in 2015, two hatted from the Good Food Guide. Named Australian Restaurant of the Year in 2016. Finally got to visit Lûmé for my birthday! A great experience and dined for almost 4 hours. The two of us had the Tasting Menu of 14 courses, $210pp with cocktail pairing (temperance pairing, $80). They also offer a Vegan course menu with the similar experience. I commend restaurants that do this for vegans as I have a few friends who are. Arrived on a Saturday night with the dining area half full, we were offered to sit at the bar for pre drinks or straight to the dining table. We chose to get down to the best right away. J didn’t have the mocktail pairing but tried the almond shake. It was very interesting – nutty and not fizzy. The set up of the 14 courses feels very similar to the degustation of Attica but with varying imaginations. We first started with sea corn taco, it’s baby corn with mud crab, the corn is very soft and felt like egg (it’s moulded like corn but it’s egg and something dairy). The crab meat was fresh and didn’t have much seasoning. The cheese taco was delicate too. Paired with Agua Fresca, a basil and kiwi fruit, very aromatic with floral scent and sour taste. J had the non-dairy one which has the darker colour of the corn. The 2nd course is preserved pine mushroom and chestnut tart, it’s a tart with preserved mushroom and fried macadamia puree. Inside is like beef tartare. They purposely didn’t mention the meat to make it a special surprise for everyone. The non-dairy one was more flakey. They then brought out the 2nd paired mocktail for the next dish; Chamomile, wattle seed and sage fizz. It was surprisingly fresh, and the best out of the two imitated champagne. It brought out the umami flavours of the next course with a nutty aftertaste. 3rd dish was Darwinian Egg, left is the non-dairy and right is the standard dish. The egg was beautiful. One of the highlights of the night. 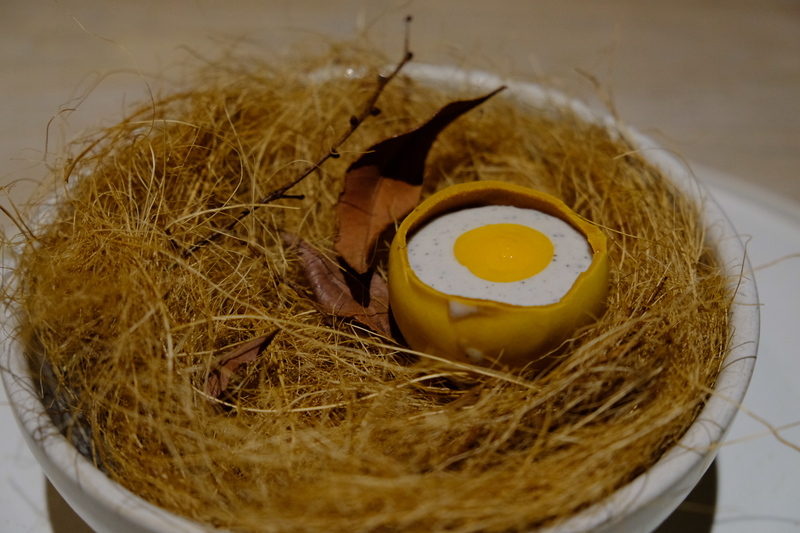 The shell of the egg is very crispy, the texture is like chocolate but savoury. Whereas inside was with some thick sauce – still a little warm. It was one of my highlights of the 14 courses. Having it with the paired mocktail brings out the nuttiness of the drink even more! 4th was Pumpkin Leaves dipped with trout roe. The leaves were very crisp. We could taste the sweetness from the pumpkin once the aftertaste kicked in. The non-dairy dipping sauce was with soy bean paste, which tastes a bit sweeter compared with the dairy option using cottage cheese. Next pairing is green apple with Tasmania’s mountain pepper and cardamom. Very refreshing when drank before the paired dish. 5th: Salted beets and elderberries, apple and mountain marigold is next. The elderberries is salty and lifts the dish from its appearance. Apple dressing is fabulous, it’s sweet and compliments the earthiness of the beetroot with hibiscus tea. Then having the mocktail after the beetroot dish brings out more of the drink’s sweetness. 6th dish is Pearl on the Ocean Floor. Paired with celery leaf and nori tisane laces. The is Lume’s featured dish that appeared on one of the elimination challenges of Masterchef 2017. Simple yet one of the toughest to create. Watch the challenge here. The dish brings us to the journey of a rock pool. Black rice and green tea as sand. Calamari and oysters with chilli hidden underneath. Accompanied with glistening Cardamon foam. The sand was very toasty, a bit like rice crackers. The shell of the white chocolate Pearl was very thin and held the ice cream inside. Another pleasant surprise because they didn’t tell me what was inside! Love the yuzu gel as it ties everything together. It was the only sour part of the dessert. All else is sweet and salty. Love the foliage and the lightly fried nori. Calamari, oysters and kingfish were all representative of the sea. Cooked nicely. 7th is Celeriac abalone, amazingly presented with celeriac puree and toasted nori on tope of the abalone. A few pears and celeriac on top of the abalone. The paired mocktail is like toasted sushi rice, using an imitation of sake to bring out the umami scent from the dish. 8th: Barbecued abalone, shiitake mushroom, emu ham and kombu, The emu bone broth with emu prosciutto was made 12 months ago. Smoking it altogether at service. My favourite element was the flaxseed cracker and thinly sliced abalone. The broth gave both these elements more prominent flavours. The emu prosciutto is interesting… meaty but not too salty. The grape is slightly sour and sweet – it was my least favourite element. Shiitake mushrooms were very nice and we could keep sipping on the broth. Having the paired imitation sake after this meal, brought out the sweetness of the mocktail. 9th dish is brocollini, but more complicated than that. Nukazuke broccoli and lemon myrtle, calamari gravy and fingerlime sprinkled to finish. I’m not a fan of broccoli, but this was amazing, the greens were in individual pieces and somewhat toasted to enhance the texture of broccoli. 10th: Artichoke sourdough with smoked eel butter and sour corn honey. Thick bread. The smoked eel butter was thick and super smooth but wasn’t too salty like normal butter. I like the honey on top of the butter to have flavours of sweetness. The non-dairy option was a nutty kind of butter. Same presentation but slightly different in colour. 11th: Aged duck smoked over melaleuca radicchio, togarashi pepper and blood lime. The duck was cooked perfectly. Small dish but was satisfied with a side of salad. Paired Mocktail is plum & strawberry versus with amaro tisane. 12th Ice cold fermented passionfruit, rhubarb and Geraldton wax. Lume’s take on their candy musk. Very sophisticated. the geraldton wax tasted like kaffir lime. It definitely took us back to childhood. 13th: Dessert got better, olive oil and mandarin peel ice-cream, fennel and absinthe paired with coconut shake, kaffir lime and mandarin. The flavours were very light knowing the ingredients in it but I loved the subtleness of each element and could taste every bit of it. The ice cream was very thick and sticky, not like the consistency of normal ice creams. The fennel had a slight bitter aftertaste but the salt bush leaves brought us back to ground and was a good pairing. The non-diary option was with soy ice cream which had the texture like what we expect. Coconut shake was the paired mocktail and it was very good, my favourite and most memorable one. Maybe because it was paired well? 14th: A simple piece of vanilla. it was just like sugar lollies, one stick each. It didn’t have the wow factor in this dessert. Then the petit chocolates, Pineapple jelly was inside the chocolate. Both dairy and non-diary version were imitating a lady bug in the garden. Lucky for us, Lûmé created another dish for me to celebrate my birthday! It was black rice ice cream with raspberry cookie. It was so fluffy and this dish surpassed the petit chocolates and a simple piece of vanilla. In my opinion, Lûmé is comparable to Attica at a slightly cheaper price per head. Similar concept in illusions but very different ingredients used. I like how Lûmé tries to mimic the same course for individuals with dietary requirements. The effort definitely shines. Lûmé has a 7 course option $140pp that offers the same complexity in multi sensory dining but you’ll be missing out on the seafood dishes if you opt for the smaller tasting menu. If anyone has tasted both Lûmé and Attica, I’m keen to hear your thoughts too. Please leave me a message. Full review of Attica is here.